Julie Kavner is not as famous as her voice, which is recognized around the world as Marge Simpson on the animated television series The Simpsons, the longest-running cartoon in TV history. She also voices Marge's chain-smoking sisters Patty and Selma, and their disapproving mother, Jaqueline Bouvier. Kavner was raised in California, but both her parents were from New York, giving her a naturally neurotic, Brooklynesque voice. She auditioned for a guest role on The Mary Tyler Moore Show, and although she was not right for that part, they wrote a role for Kavner when Valerie Harper was spun off to Rhoda in 1974. Kavner played Rhoda's pretty but insecure sister, and won her first Emmy in the role, in 1978. She later had a featured part in Woody Allen's Hannah and Her Sisters, and played Allen's mother in Radio Days. 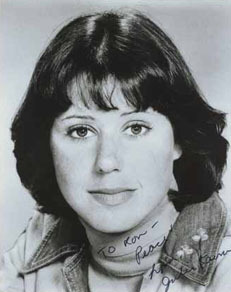 In the ensemble cast of The Tracey Ullman Show, Kavner first voiced Marge Simpson in short animated segments, while performing in-the-flesh in other roles. She also voiced Marge in two Fox theatrical cartoons before The Simpsons became a TV series in 1989. To perform Marge, she raises her voice an octave or so, and "roughens it up a bit." To do the sisters, she lowers her voice an octave, and roughens it up a lot. She says voicing The Simpsons takes about two half-days a week, about six to seven hours of recording to voice an episode. Kavner won a second Emmy for her Simpsons work. In 1998, after a threatened walkout, the principal Simpsons actors were given a raise from $30,000 to $125,000 per episode. In 2004, they refused to speak their lines until FOX agreed to pay $250,000 per episode. By comparison, the principal actors in Friends were paid $1 million per episode by the end of that series' run. Kavner has been reticent to do many Simpsons-related interviews. When the cast of The Simpsons appeared in a 2003 episode of Inside the Actors Studio, her castmates began speaking in character, but Kavner took a bathroom break halfway through the show and did not return. "If I want to remain anonymous", she says, "I have to keep my mouth shut." Sitcom producer David Davis was there when Kavner auditioned for The Mary Tyler Moore Show, and he has been there ever since. Kavner and Davis have lived together for so long, friends (and the law) consider them married.